You hum the Topsy and Tim theme tune in your bath. And don't even realise it. You are oblivious to the latest chart busters, but you know the words to the Postman Pat song. Jess the cat sound effects included. Meow! All that you ever watch during the day is CBeebies. Or nothing. You have heard the story of the Billy Goats Gruff at least five times every day since you bought that CD. You join in animatedly at each telling, pretending to be the troll under the bridge. The only time you go to the cinema is to watch the latest offering from Disney Pixar. A night out means another three year old's birthday party. At 6pm. A day out means a trip to the park. You empty your coat pockets and an assorted collection of plastic frogs, chocolate wrappers, snot-soaked tissues and dry daisies fall out. You never leave home without a shiny back-pack with a month's worth of food rations packed in. And wipes. "Now," becomes your life's mantra. Date night means watching catch-up TV while dining-in on the sofa. You find yourself beginning to doze-off at 10:30 pm even when child-care is sorted. Sharing a bed means fighting your corner to claim bed-space that rightfully belongs to you and is being threatened by the habitual midnight/early morning wanderings of your precious offspring. The only child-free space in the home is the shower. When you are in it. Mostly. All that once belonged to you is now facing a take-over bid from a myriad of books, crayons and construction bricks. You can issue instructions and mend broken toys when on the toilet. Simultaneously. Forget the souffles and the creme brulees, puddings now mean jelly and ice-cream. And food generally means fish fingers and chips. You leave the house without an iota of make-up on, glowing in the knowledge that you managed to get a brush to the child's unruly locks. You realise that your jeans and the rest of your clothing are a very handy substitute to hand washing. Or hand towels, if you are lucky. You are struck by the futility of doing your hair. For your head is perceived to be the perfect perch when the child is being helped into his shoes. You find yourself saying things on a loop. Over and over. And over again. Almost all your writing tends to revolve around the shenanigans of your three year old offspring. I don't have much experience of this yet (just with my stepdaughter) but have a lot to look forward to it seems haha! It is shocking what comes out of our bags and pockets these days! I have to say though I cannot identify with this as I am not yet a parent, I can emphasise via friends and their experiences! I can totally identify with this - I keep singing the Topsy and Tim theme tune!! This all sounds very familiar! 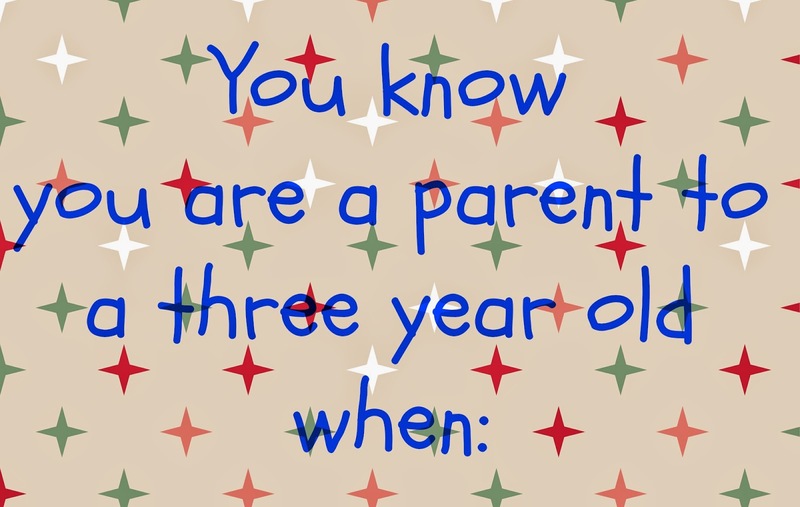 My son is three years old. Ha yep agreeing with these as feel the same most days . I still often wake to find my boys in our bed and they are 8 and 9! I love the hair one, it drives me crackers when they use my head as a handy resting place, particularly if I've actually brushed my hair!! Topsy and Tim has escaped me but I do end up singing Sofia the First or Doc McStuffins - great list! Hehe like the holding onto your head whilst doing shoes! My twins do this still and they're 5! !